1 medium glass bowl ( I used a Kosta Boda art glass bowl). Ikebana is the Japanese art of arranging flowers. Ikebana means, "flowers kept alive". The earliest school of Ikebana was founded in the 15th century. This arrangement is inspired by the moribana Basic Upright style. The photos for this post were inadvertently reversed, so refer to the diagram below for this paragraph. We will be using a kenzan or "floral frog" to make this arrangement. Kenzans have a circular brass base and brass pins with sharp tips that are about 1/2 inch long. 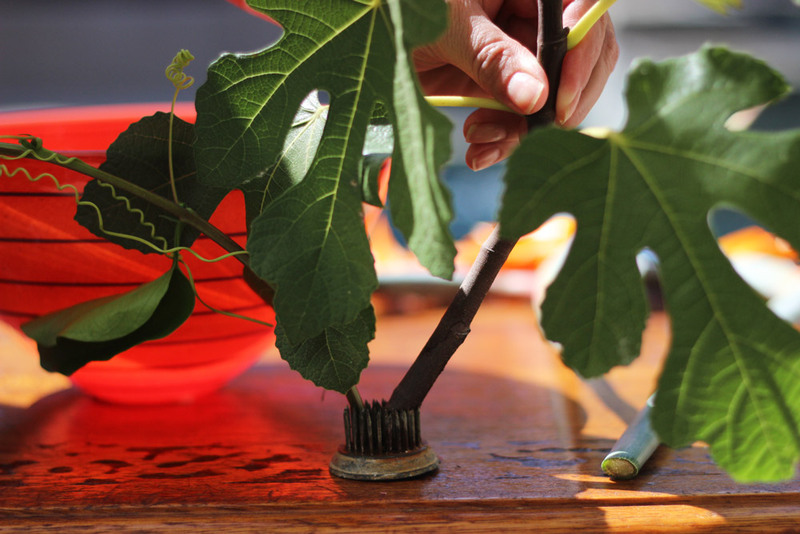 You will push the flower stems and branches into the kenzan at a set angle. See the diagram below. If you were looking at the arrangement in the frontal view, pretend you are holding a clear protractor in front of it and that the blooms of the stems form an imaginary arc made from two 90 degree angles back to back with 0 degrees being the vertical between the two. You may need to review your geometry. The stem that goes out at a 15 degree angle from vertical to the left is called the Shin "Truth" and represents Heaven. The stem that goes out at a 45 degree angle to the left of vertical is called the Soe "Supporting" and represents Earth. The offsetting stem that goes out at a 75 degree angle to the right of vertical or 0 degrees, closer to horizontal, is called the Hikae "Moderating". It represents man. The meaning attributed to each element in the Japanese art form, may be profound. But from a floral arranging perspective, the Hikae is like a ballast and balances the stems on the left side. In this arrangement, there is also a supplementary stem. Supplementary stems are shorter, but in this case the supplementary stem is another Bird of Paradise and it is a little shorter than the other Bird of Paradise stem. 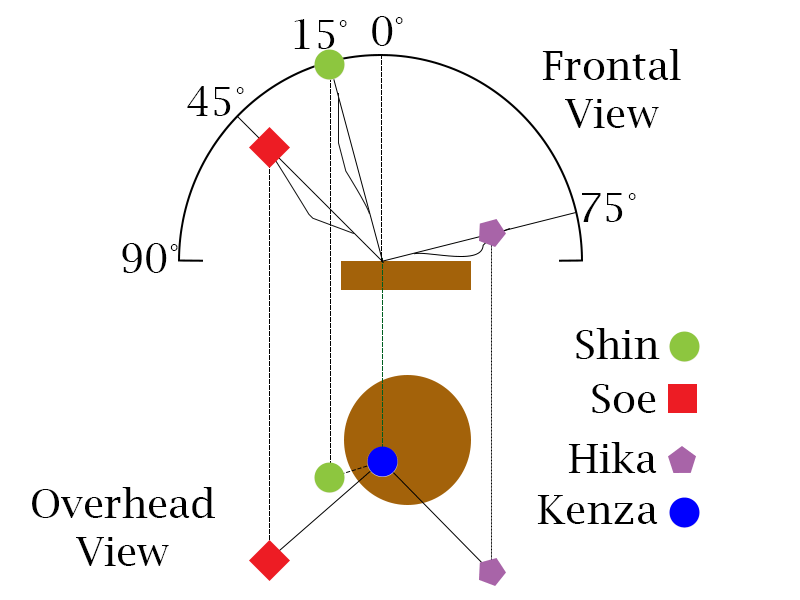 When you look down from the top at your arrangement in an overhead view, the Soe and the Hikae should form an upside down V. The Shin should be slightly to the left of the Soe. The kenzan that I used was a little small for the weight of the flowers and branches used. If I had one, I would have used a larger kenzan, but to compensate and help provide balance, flat black river rocks were used around and on top of the kenzan. Ikebana arrangements are usually done in glass bowls. I used a vibrant orange Kosta Boda art glass bowl with horizontal stripes. 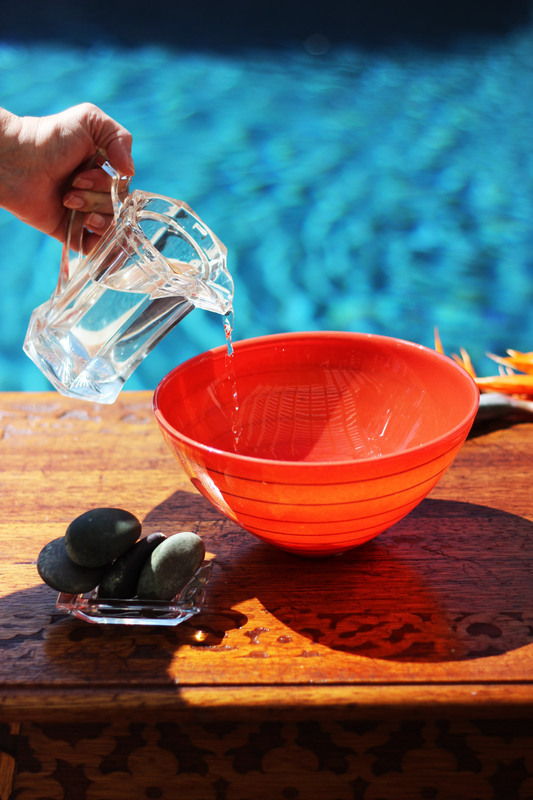 The glass has vivid color and a translucent quality. Well, if you have your kenzan, your bowl and your neighbor's flowers and branches, I think you are ready to go. View from the front is on top. Coordinating overhead view is below. Flowers and branches are represented by green, red, and lavender shapes. Here are the materials you will use, the river rocks, the kenza (center front) the Kosta Boda bowel and the flowers and branches. The kenza (center front) holds the stems in place with its spikes. 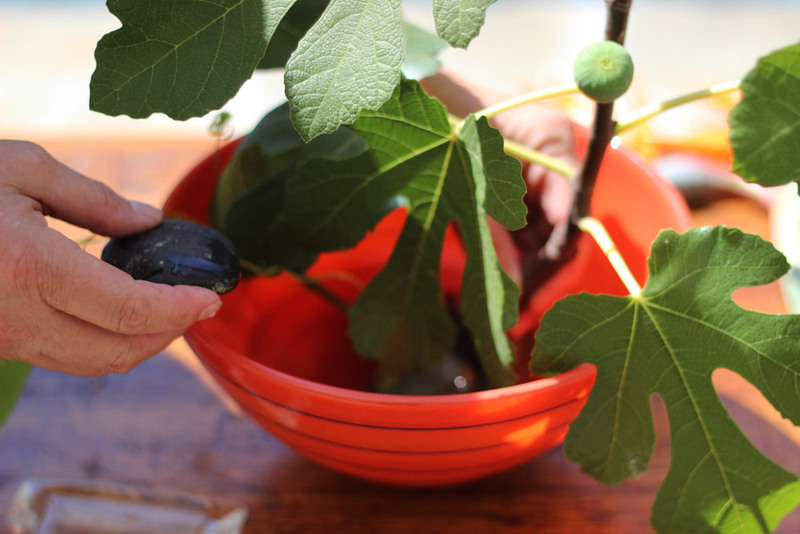 The passion fruit vine is inserted at a 75 degree angle and the fig tree branch is inserted at a 45 degree angle. 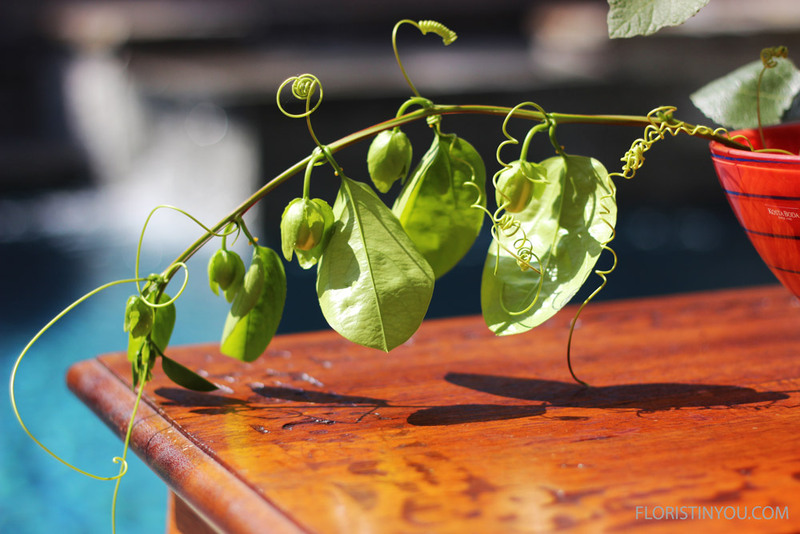 Look at the beautiful curls on this Passion Fruit vine. 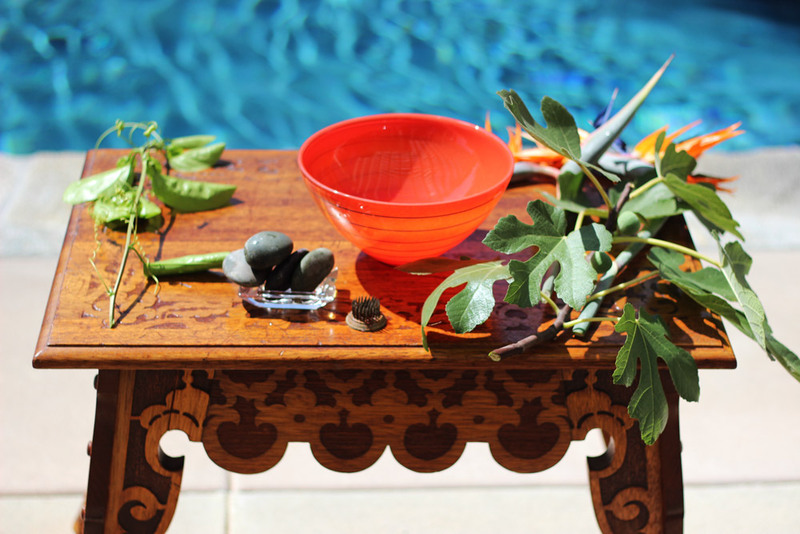 Since Ikebana means "flowers kept alive" you will need to pour water in the bottom of your bowl. The fig branch and the Bird of Paradise stem were very heavy, so river rocks were added at the base to add weight and stabilize the arrangement. With these oranges and blues, this could be a study on complimentary colors. We will add these Bird of Paradise flowers next. The arrangement is complete. Enjoy the beauty and serenity of nature with this arrangement.